A new year once again. Time to get out that new datebook and draw up plans for the next 365 days. Lofty goals, mad schemes, strict regimens, exciting getaways, plans, plans, plans. Some challenging and tough, leaving us quaking a bit in our shoes but determined nonetheless. Some big and exciting and wonderful, leaving us exhilarated and chomping at the bit. All mapped out resolutely, whether pen in hand or fingertips firmly on keyboard, with all the bright-eyed and buoyant intention a new year brings. I, for one, am not immune to this dewy feeling of slate-wiped-cleanliness. And no matter how many resolutions I have hoodwinked in the past, I still like to set out, sails a-flutter, with what I’d like to do this year carried jauntily on my sleeve. Minimize. Avoid waste. Focus on the things that are truly important to me and trim away the excess. Learn to say no. Consume less. Save. That’s not to say I won’t treat myself to little luxuries…but they will be luxuries I can comfortably afford and that are truly, 100% appreciated by me. And also, it must be said, organize! De-clutter this flat and our lives. Do more. Experience more. Laugh more. Open my eyes. Put myself in new situations that may make me extremely nervous. Say yes more (seems to contradict with the statement above but it really doesn’t – it’s all about mindfulness of choice). Live on purpose. Meet more people. Engage. Travel (even if it’s just to the next city). Make memories. Be in the now. Every day. Be conscious of it. Record it. Share it. It’s amazing how being thankful can make you feel like you are twice blessed…once for the blessing and then again for the happiness of realizing it is a blessing. Nip negative thoughts and comparisons at the bud. Focus on all the amazing positives that abound! Can you live simply and be fabulous? Absolutely! Fabulous is in the way you live, the way you are, not in the things you have. Other people like to refer to this as “awesome”, but I prefer fabulous. Under this would fall being kinder to my body. No, you won’t be seeing trendy eating regimes and fancy exercise routines here. I don’t think you ever will, truth be told. But I will be less reckless about my health. I will also be looking for ways to move more (I think my old ticker needs and deserves it) that do not involve the gym or sports or special outfits. Also, I may finally be wearing makeup this year. And perhaps moisturizer (with sunscreen). At 39 years of age, I think it’s about time. Suggestions are welcome! But most of all, being fabulous means feeling fabulous and making others feel that way too. And, as always, there will be cooking…and eating. Optional: bird’s eye chili or siling labuyo, or chili oil…if you like a little heat! – Soak your clams in cool, clean water for a couple of hours (or more), changing the water 2-3 times until water is clear. Scrub any impurities off the shells. – In a small bowl, mix together the hoisin, soy sauce, mirin, oyster sauce, sesame oil, honey, and chili (if using) until thoroughly combined. Set aside. – Heat a large skillet on medium-high heat. When the pan is hot, add the oil, swirling to coat the bottom of the pan. – Add the garlic, onions, and ginger to the pan and sauté until the onions are soft and translucent. Add the clams to the pan and toss until coated in all the garlicky, gingery oil and soft onions. Add the sauce and toss until evenly distributed amongst the clams. Cover the pan and cook until the clams have opened up. This won’t take long…under 5 minutes most likely. 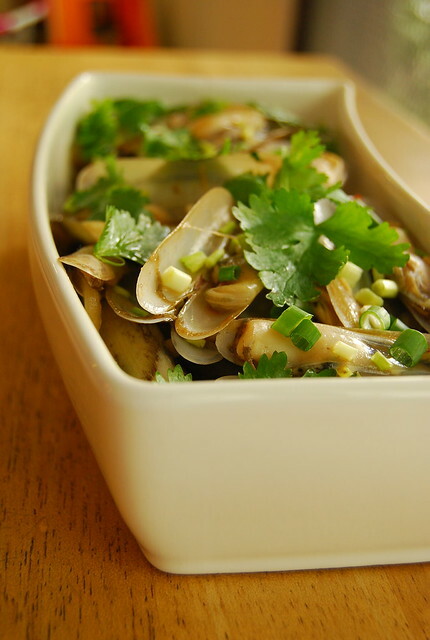 – When the clams are done, take the pan of the heat, strew with the spring onions and cilantro, toss, and serve immediately. These shellfish have nothing to do with New Years resolutions but I’ll share them anyway because they’re delicious. I think these are referred to as razor clams but my mother calls them bamboo clams, and since I like bamboo better than razors, so will I. The juices here are fantastic spooned over some warm rice. This is an easy, light dish with a lot of flavor…as with many Asian, or Asian-style, dishes. Something to start the New Year on a vibrant note! Wishing you a simply fabulous 2014 with a bounty of things to be grateful for!! What will you be doing in 2014? You can do all of those with FOOD 🙂 Its one of those simple and yet luxurious joys this earth can offer. Happy New Year!!!! Happy New Year, Jo! Great focuses for the year! I've tasted/eaten razor clams once many years ago and I remember really loving the dish (with some salty black beans). But I am not quite sure what to do with them (if there is anything else I need to do to clean them…)and when I see some in the Asian market bundled up with a wide rubberband, they look a little gross hanging out from the razor-looking shells (lol). This post is inspiring me to give it a try. Thanks! Mmm! This would be the perfect thing to eat on a cold night! Hi! Happy new year! Are bamboo clams the same as angel wing clams? This is my favorite served in a small restaurant in a market in Barcelona. Where did u buy them here? I love this recipe! This is really delicious recipe to make for lunch. Where did you buy razor clams? Thanks Rosa! Wishing you a fantastic 2014! Hi Didi! Yup!! I agree! 🙂 Happy New Year! Hi Mieke! Happy New Year to you and your family as well! Hi Midge! It would 🙂 Or on a nice afternoon with some beers! Hi Borisa! Hope you give it a try!